There is a world beyond Turing, as more and more computer researchers are demonstrating, but where would you find out about the current leading edge in unconventional computation? 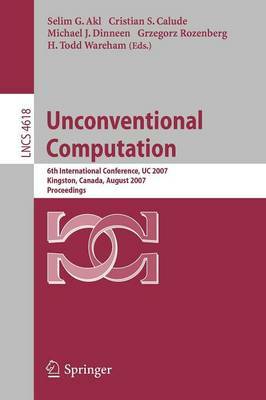 Here, in this fascinating work that is the refereed proceedings of the 6th International Conference on Unconventional Computation, held in Kingston, Canada, in August 2007. The 17 revised full papers presented together with 4 invited papers were carefully reviewed and selected for inclusion in the book. All current aspects of unconventional computation are addressed.